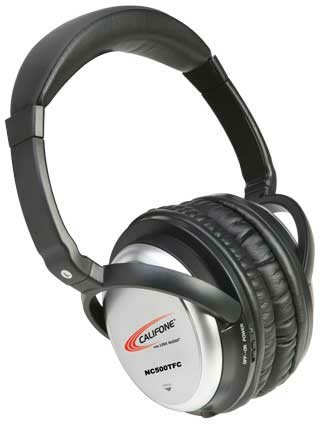 Califone often sets the educational standard for audio equipment and we've done it again with the first active noise-cancelling headphone designed specifically for school and library environments. The NC500TFC Active Noise Cancelling stereo headphone is ideal for high stakes language testing that requires the quietest of individual settings including classrooms, learning centers and labs. It can be used by itself to block out external noise and outside distractions as well as to listen to audio content when plugged into a multimedia player or computer for literacy, ELL/ELD, language learning applications and music appreciation. The ability to block background noise when coupled with this innovative, proprietary technology provides the utmost in enhanced sound quality and improved speech clarity to make it easier to isolate and hear key words, tones, and inflections without increasing the volume. By filtering out undesirable sounds and reducing distortion, this headphone increases the perceived loudness by creating high frequency harmonics that are not masked by low frequency sounds without raising the actual volume, which allows students to remain focused. This will encourage students to reduce the level of playback to a safe listening level for hearing protection with its in-line volume control. The NC500TFC headphone is also the most comfortable in the award-winning line of classroom quality listening devices. Upgraded, replaceable leatherette earpads and the lightweight ergonomic design help make it comfortable for extended periods of time. A power LED light indicates active noise cancellation or it can be powered off for passive noise cancellation with its on/off switch. It has an adjustable, cushioned headband that comfortably fits students of all sizes, ambient noise-reducing over-the-ear earcups that allow students to hear previously indiscernible sounds, and a 5' detachable straight cord with 3.5mm stereo plug and audio adapter. The swiveling earcups on the NC500TFC fold flat inside its hard-shell storage case when not in use.